@#18 on my list of Bob Dylan’s top 200 songs. ..released on his 15th studio album, Blood on the Tracks, in 1975. 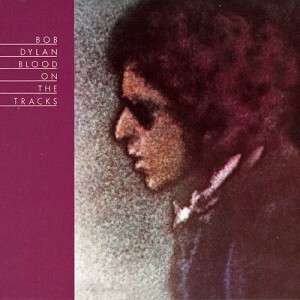 Along with “Tangled Up in Blue”, “Shelter from the Storm” was one of two songs from Blood on the Tracks to be re-released on the 2000 compilation The Essential Bob Dylan. The song also appears on two live albums by Bob Dylan — Hard Rain (from a May 1976 performance) and At Budokan (recorded in February 1978). A first take of the song, from the same recording session that produced the album track, was first featured on the soundtrack to the 1996 motion picture Jerry Maguire. The same take was also featured on The Best of Bob Dylan the following year. Take 1 released on JERRY MAGUIRE – MUSIC FROM THE MOTION PICTURE, December 10, 1996. Also released on THE BEST OF BOB DYLAN, Columbia, June 2, 1997. Take 5 released on BLOOD ON THE TRACKS, January 20, 1975. It’s a never-ending battle for a peace that’s always torn. “Come in,” she said, “I’ll give you shelter from the storm. That first line represents the only moment in the song where he explicitly expresses the hope that she may once again provide shelter. This could be why it stayed a part of the song long enough to be recorded; as fans discovered when an alternate take was used for the soundtrack to Cameron Crowe’s jerry Maguire movie. That word-perfect fifth take survived all the reconfigurations the album underwent, emerging as one of its real highlights. And though Dylan went on to perform it a number of different ways – almost always effectively – the nature of the song remained fixed. Whether singing it loud and clear to its subject at Fort Collins in 1976, introducing a full- blooded arrangement as ‘the story of my life’ in 1978, noodling back to a mellower self in 1987, or getting back to the country at the Warfield in 1992, the song has endured as long as that yearning for ‘a place where it’s always safe and warm’. In this song, Dylan was probably inspired by the book of Isaiah in the Old Testament, which, according to Christian believers, announces the coming of the Messiah. 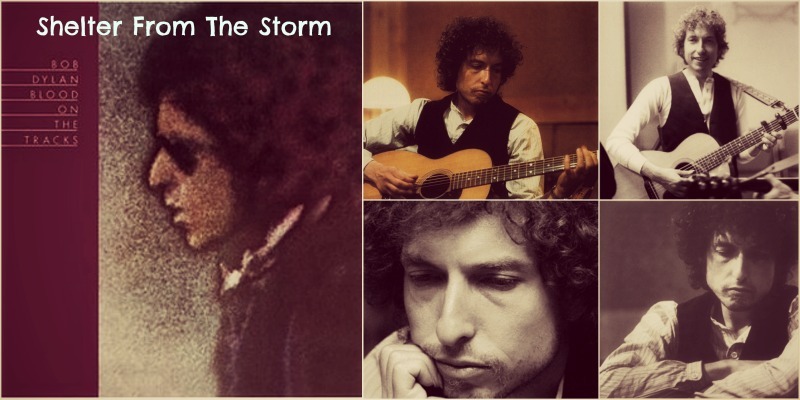 In fact, the experience of the character in the song, being offered shelter from a storm by a benevolent woman, takes on a special dimension: “‘ Come in,’ she said, ‘I’ll give you shelter from the storm.’” The reference is even more explicit in the fifth verse: “She walked up to me so gracefully and took my crown of thorns.” Dylan creates this Christ-like figure in an undeniable Western atmosphere, with open spaces, the deputy sheriff, the preacher, and the one-eyed undertaker. This “Christ” who bargains for salvation and offers his innocence but receives only scorn asks the right question: is it all only despair? His only desire is “turn back the clock to when God and her were born.” In this interpretation, the song appears to be a metaphor: love as an act of redemption, eternal love beyond the rapture, which is only ephemeral. This can still be a metaphor for rebirth. Thus, the kindness and sense of mercy of a woman allow the “rebirth” of the narrator. “Shelter from the Storm” included an eleventh verse that was removed from the final version. The twin moods of “Shelter From the Storm” are best captured in two wildly different performances. On Blood on the Tracks, the song is an acoustic reflection on a relationship mysteriously gone bad, a fond remembrance of a woman who, for all her faults, provided the singer a respite, however brief, from the world’s trials. On the live album Hard Rain, meanwhile, the song is a roaring rock & roll juggernaut, a sneering denunciation of a hypocritical lover whose offer of a warm, safe haven is dismissed as a cynical joke. Encompassing such emotional extremes within a single song is one of Dylan’s most distinctive gifts – in this case, a song that took shape as his marriage to Sara was disintegrating. “Beauty walks a razor’s edge,” he sings, and as the song makes clear, when you pursue it, you sometimes bleed. ..And Shelter From The Storm is also an example of how good he is at making a verse melody so circular it becomes the hook and he doesn’t have to use a chorus. It’s almost like a nursery rhyme. “‘Come in, she said, I’ll give you shel- ter from the storm.” You never really know who she is. A spiritual figure? Is she a prostitute who took him in after he took his woman ‘for granted, got my signals crossed’? Although with all of his relationship songs I’ve assumed they’re about Sara. Maybe that’s wrong, but that touches the music for me. Blood on The Tracks is a break up album but songs like “Shelter From The Storm” are a lot more tender than many of Dylan’s songs. It’s very warm and human. When I’ve had a really bad time I hear that song. I’ve got like a jukebox in my head and that song’s on it. It’s the most biblical,apocalyptic song in terms of the Jesus fixation and the way people look at him. It’s very dark, great poetry. The Blood on The Acetates version is great, too. The jerry Maguire version includes an extra verse (as indicated) and verse #6 is moved between #8 and #9. There are also other minor differences as: “…they/she gave me a lethal dose”, and others. To close a remarkable evening, instead of running through a couple of standard encores Dylan returned for a magnificent “Shelter From The Storm”. The song started quietly, with phenomenal care taken over the vocals, before building up to a climax infused with extensive and intense harmonica playing. It was another performance of epic stature..